David Grainger (left) congratulates Stan Rigby. After welcoming the visitors, the master of the lodge, Malcolm Berry, opened the lodge in due form to carry out the administrative business of the lodge. On completion, the director of ceremonies, Trevor Phillips, requested permission to retire for a short time. 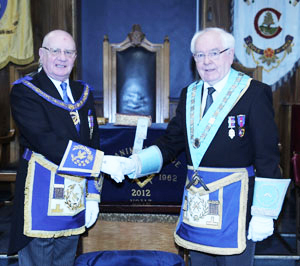 He returned to announce the presence of Assistant Provincial Grand Master David Grainger. 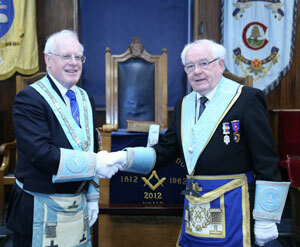 David duly entered accompanied by acting Provincial grand officers to be greeted formally by Malcolm. For purposes of installation Malcolm invited John Watson to occupy the senior warden’s chair, Douglas Atkinson to occupy the junior warden’s chair and Allen McGlen as inner guard. Commencing the installation ceremony, the master elect, Stan Rigby, was duly presented and addressed for installation by Ray Taylor. Malcolm then reminded Stan of his duties as master and went on to install him as master of the lodge in a warm and sincere manner that was genuinely appreciated by all the brethren present. Malcolm Berry congratulates Stan Rigby. As part of the investiture of officers, John Watson as senior warden and Kevin Ruffley as junior warden were instructed of their duties by Ray Taylor. The third degree working tools were delivered by Garry Norris, the second and first degree working tools by Trevor Phillips. 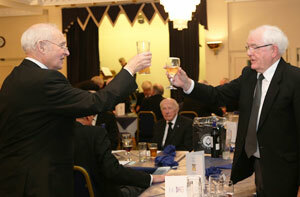 The ceremony concluded with an address to the lodge brethren, delivered in a meritorious manner by Peter Watson. David on behalf of the Provincial Grand Master Tony Harrison, brought his congratulations and best wishes to Stan in taking the chair for a second time. Turning to Malcolm he congratulated him for his work in installing his successor and thanked all the brethren who took part in what he described as an excellent ceremony. He particularly thanked Peter Watson for his outstanding delivery of the address to the brethren and congratulated Trevor on his management of the proceedings. Stan responded and thanked David for his kind comments on behalf of the Provincial Grand Master, moving on he presented David with three cheques, the first for £500 for the 2021 MCF Festival and two for £250 to the Rosemere Cancer Foundation and Preston Masonic Hall. David thanked the members for such a magnificent amount donated. After the principal guest and group officials had retired, the lodge was closed in due form. Kevin Ruffley (left) sing’s the master’s song. At the festive board in response to the toast to the grand officers, David brought his own congratulations and good wishes saying how much he had enjoyed the ceremony. David thanked the lodge for their generous cheques to charity, mentioning the MCF 2021 festival as the Province’s main focus. David also expressed his delight at attending a daytime lodge as he could relax in the evening when he arrived home. David then went on to talk about the lodge’s 200-year history which was formed in 1767. Although the first minute’s date from October 1814 however, Grand Lodge returns date from 1812. The lodge was a military lodge of the 3rd Royal Lancashire Militia, based in Dover numbered 147, but in 1816 they were back in Preston. In 1823 they became a civil lodge, as a consequence of the union of the two grand lodges. In December 1813 the lodge became 179 and following a reshuffle of numbers by Grand Lodge they were renumbered to 130 in 1832 and 113 in 1863. It’s a remarkable achievement that the lodge is still flourishing and the next ceremony is a first degree. After a hearty meal, a raffle was held raising the grand sum of £271 which was divided between the MCF 2021 Festival and lodge funds. We were further entertained by a delightful rendition of the master’s song given by Kevin Ruffley and accompanied by Howard Linaker on the piano.